What could possibly be more “Florida” than orange juice? The state of Florida produces 67 percent of all U.S. oranges and accounts for 40 percent of the world’s orange juice supply. Next to tourism, citrus production is one of the top moneymakers for the state. Tropicana buys 30 percent of all oranges grown in Florida. The Tropicana plant in Bradenton, Fla., processes 50 million oranges a day. That translates into a million gallons of orange juice. Brenda Lanning Marlow (’88 consumer food science) is a manager in manufacturing at Tropicana, where she’s worked in a variety of positions for the past 21 years. She’s a quality control expert, working to roll out new products, keep production costs down, and improve efficiencies in the manufacturing process. 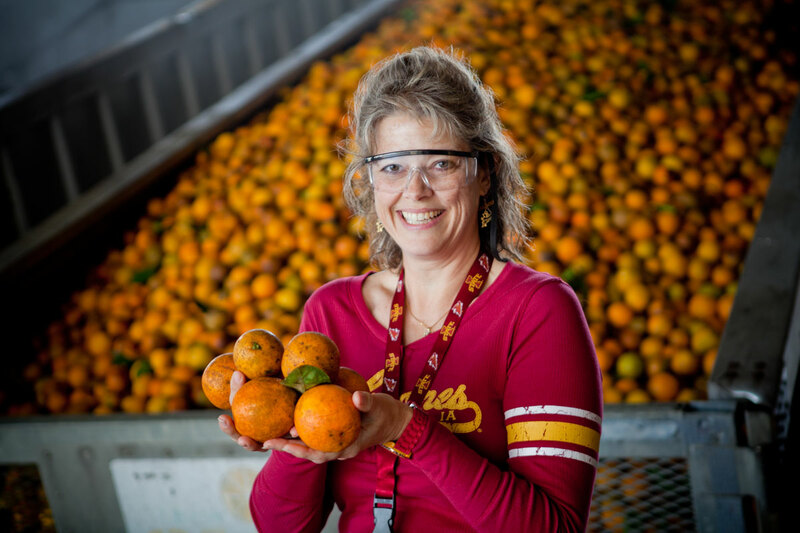 During our visit to the plant in mid-February, Brenda gave Jim and me a tour of just a small part of the huge, 285-acre plant, including the fruit-receiving area where truck after truck filled with fresh-smelling oranges pulled in and dumped their loads. A Marshalltown, Iowa, native, Brenda is an avid Cyclone sports fan, as evidenced by her office decorated with Iowa State posters and other paraphernalia (“I really didn’t do this for the photos,” she insists. “It always looks like this. Just ask my co-workers.”) She’s also the president of the ISU Alumni Association Club of Tampa. As we prepared to leave, Brenda gave each of us two cold cartons of orange juice to drink on the road. And then she mentioned, as if it were no big deal, a huge personal accomplishment: She recently lost more than 90 pounds and has begun organizing Weight Watchers meetings for a group of co-workers, resulting in more than 100 pounds of weight loss within the group just over the past few weeks. Wow – that’s truly impressive leadership. Brenda is married to Steven Marlow and has two stepchildren, Joshua and Rachel.